I've been a location photographer for more than 25 years, knowing where and when the sun rises and sets is very important to my business. With the advent of the Internet as well as some fantastic web sites, this task could never be more simply. Like a lot of photographers, before I head out to a new location I"ll first visit Google Maps/Google Earth to become familiar with my location. 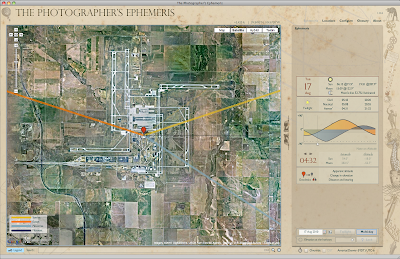 The next thing I'll do is open a program called "The Photographer's Ephemeris". This program is a free download for the desktop version, and the mobile version for your iPod Touch or iPhone is about 9 bucks. What I like most of all about the program is, I can use a slider to advance the suns position throughout the day. With the satellite view, it allows me to see from what angle the suns position will be in at any given time and therefore allow me to plan my photographic day. The program uses different colored lines showing you the exact line at which the sun will track. 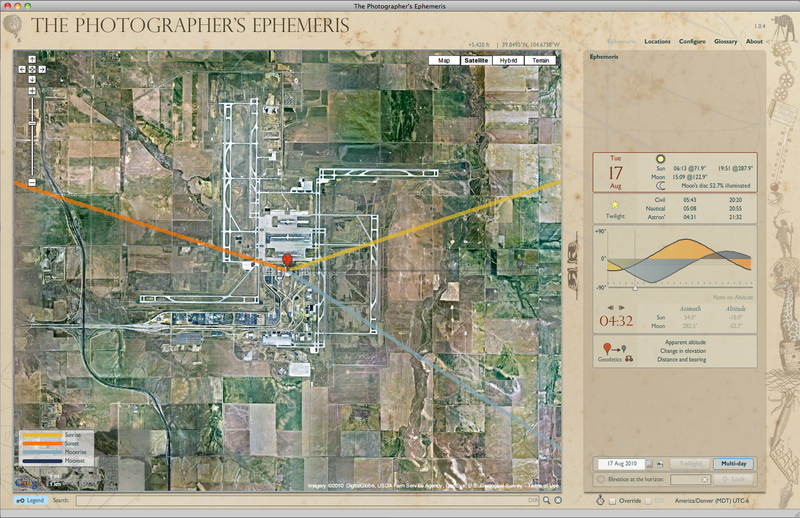 As you move the time slider, the line indicating the suns position will move across the map. Back in July of this year, I had the opportunity to guide a Mentor Series Trek to Newport, Rhode Island. We had a wonderful trip despite an occasional light rain. We were walking around downtown Newport shooting the sights when one of those light showers began. Wanting to get out group out of the rain, I noticed a Lobster Company down at the water front and asked if I could bring the group inside to photograph. The folks at Aquidneck Lobster Company could have not been kinder. 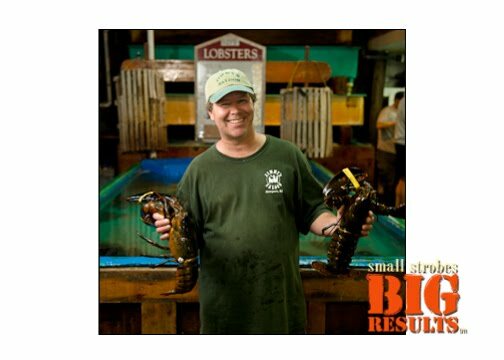 We spent about 30 minutes in their facility photographing all the lobsters and the various other details associated with the profession. I took the opportunity to photograph one of their employees holding a pair of lobsters. The lighting was the same as the previous post regarding a simple set-up. I had one of the Trekkers hold the Lastolite Tri-Grip with a single SB-800 shooting through it. I set the strobe to Remote, placed it on Channel 1, Group A and manually set the power via my built in flash. I placed the ambient first and than lit up the flash. By the way, I'm head back down to the Santa Fe Workshops for another week of teaching. There are still a couple of spaces available if you have the time or interest. October 12th- 16th. Give the workshops a call if you can make it. Several weeks ago I was teaching at the Maine Media Workshops. I love teaching there, what a great place to visit and a wonderful staff at the school. I would like to thank my TA "Justin Clamp" Jason Esposito for working so hard during the week. 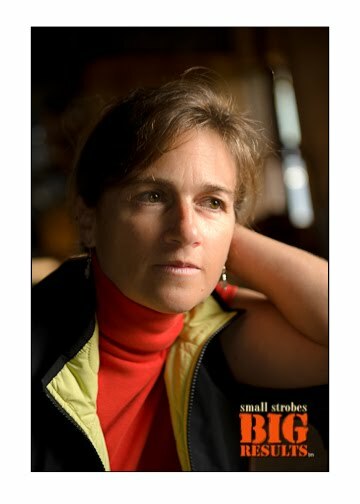 I look forward to teaching in Maine next year! 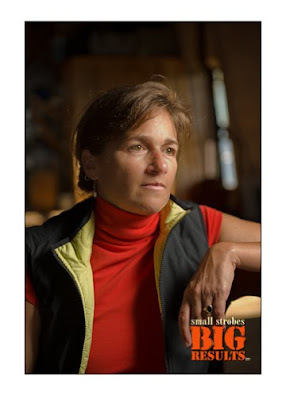 The photo shown at the top of this post is that of Margaret H., she was a signing interpreter provided by the workshops for one of my students. Rocky, lost his hearing at the age of 9 months of age. He has taken close to 20 workshops thought the years, studying with Ansel Adams, and Minor White. It was a real pleasure to have Rocky in my class, I was able to pick up some signing by the end of the week. 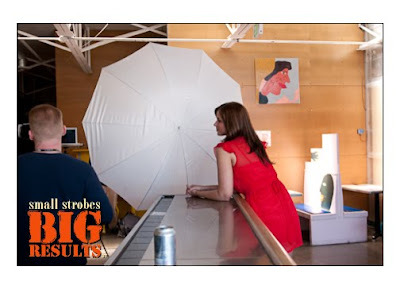 The lighting for the photo above was handled in the following manner. I first placed the background ambient light to the density of my choosing. You can see here that that test shot shows the set-up. 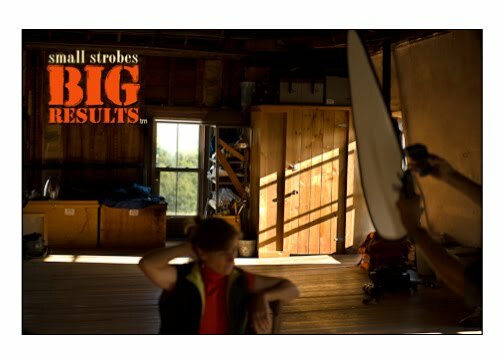 On the left side of the frame, you can see the Lastolite Tri-Grip being held in one hand and a Nikon SB-800 in the other. The exposure was 1/250th @ f3.2. This has got to be the fastest way to shoot a quick portrait. 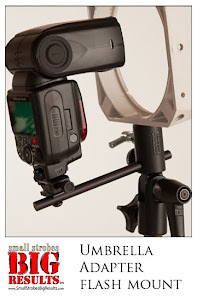 All you need is a voice activated lightstand (VAL). Here is the second of the two I took of Margaret. Once again, I'd have to say "I love my FourSquare™". Sometime ago I made mention about this particular technique, using two umbrellas on the FourSquare™. During my March SSBR workshop in Denver, I photographed Andrea using this technique. The take the FourSquare™ block and I slide a 60" umbrella and a 43" umbrella into the umbrella shaft holder, there are two. 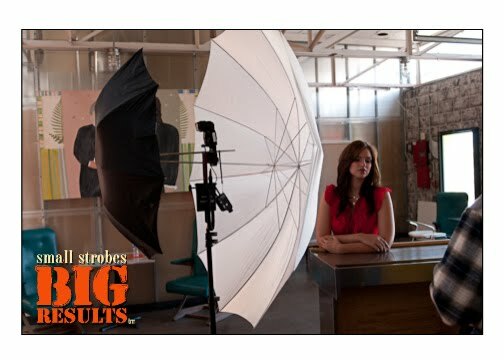 As you can see from the image above, the 60" umbrella is used as a shoot through and the 43" as the bounce. The 43" has the black cover over it and as mentioned, the 60" is close to the subject in the shoot through position. This is an incredible light, large, soft and just plan beautiful. In the image below you can see the quality of light produced from this set up. My WB in the camera was set to Daylight for the image below. I later placed a full cut CTO over the flash head and shifted my WB to 3030*K. The resulting blue shift in the background is from the daylight coming through the window in the back of the scene. Those results can be seen in the image below. You can view more workshop images created during various SSBR workshops HERE This link will take you to a new web site I created at SquarSpace, I hope you like it.